Utility knives fare knives that are used for household purposes. Those knives are mainly used for cutting materials that are too heavy for scissors, such as cardboard, wood, or plastic. These are an excellent and affordable way to handle work around the house. Unlike the pocket knives that will become dull and might easily break, utility knives have replaceable razors. Utility knives mainly consist of three categories. First is the folding type, they are not as sturdy as other types but they are more compact. They easily fit in a pocket or on a belt and can be carried throughout the day.Second type is the retractable knives. They are heavier than folding type, carry more blades, and are better suitable for harder jobs. However they are big and bulky to easily fit in the pocket or comfortable carry with you every day. Last type is the fixed-blade style knives. These are used for specialist works such as handling wood or thick boxes. There are many types of knives available from each category. Here is a review of some of the knives from the Amazon. This is one of the most popular quick-change folding utility knife. It is ideal for general-purpose cutting. The main advantage of this is the quick-change blade replacement mechanism which makes is easy to replace blades. Second strength is that it is folding and very compact to carry with you anywhere. It has a belt clip which makes it easy to attach to the belt. Last strength is that it comes with 11 blades, one pre-installed while 10 are in the dispenser. It is made from aviation grade aluminum, which is light and sturdy. This blade is a great choice for the first time purchaser who is looking for a great utility knife which is easy to maintain and very comfortable. Priced at $12 at Amazon it has five star rating and a great reviews by buyers. DeWalt DWHT10035L is are retractable and foldable utility knife. This brings the best combination as it allows blades to retract and folded. There is a lock on the back of the blade that allows foreasy retracting or closing. Due to retractable nature it is a very safe knife, because the blade will be stored inside the metal body. This knife is very compact because it is foldable. The steel body makes it sturdy and it comes with belt clip. Metal body is durable and weather resistant, but it can be a little slippery. Blade changes are rapid thanks to the one-button system that can easily be operated with gloves on. Furthermore, it has a wire stripper on the body that makes it universal. This is a classic looking retractable knife with a metal body. It has an interlocking nose that holds the blade securely. Three-position retractable blade with three different lengths for the blade. Due to sturdy locking mechanism, the blade is hold securely and it is strong for everyday use. There is a blade storage in the handle of the knife and blade is stored inside the body of the knife. This blade comes with three sturdy and high quality blades that stay sharper than most other blades available in the market. For just $5.80, this is a great knife for those who want a sturdy and classic looking knife and will usually store it in instrument box. Fastback II is a folding high grade utility knife. It has one handed opening mechanism which is way better than in any other blades. You just press the release and the blade opens up and locks, ready for action. The locking mechanism is very safe and strong so it will not break while using or open up in the pocket when storing. It has a metal construction and comes with one blade. The blade storage is plastic. This is a knife that is praised by many reviewers all over the internet. They claim that this is the best overall and make it a best pick. Priced $39.40, this is a premium high quality knife that is well recommended by the professionals. This is a heavy duty retractable knife with a modern look. It is great for those who need a heavy-duty, professional grade knife that can handle the deep cuts. This is a professional blade with very sharp and hard blade. This can easily cut wood and other hard materials. If you are looking for a professional grade blades for heavy duty work, then this is the knife for you. However, if you just need a daily driver for simple cuts and need cutting thin and soft materials, then this will be too much for you. It is recommended that you get another knife, because this might be too sharp for you and you might damage your things.Other than that this is some heavy duty knife at a great price. As we can see there are many different kinds of utility knives. They vary in the functions and each try to offer more than its rivals. If you are looking for first time purchase, then Kobalt Utility Knife is the best pick. Those who need retractable knife, then Olfa 5003 L-1 or Stanley 99E are both great knives at a great price.Olfa L-1 though is best suited for professional work because it is too sharp. 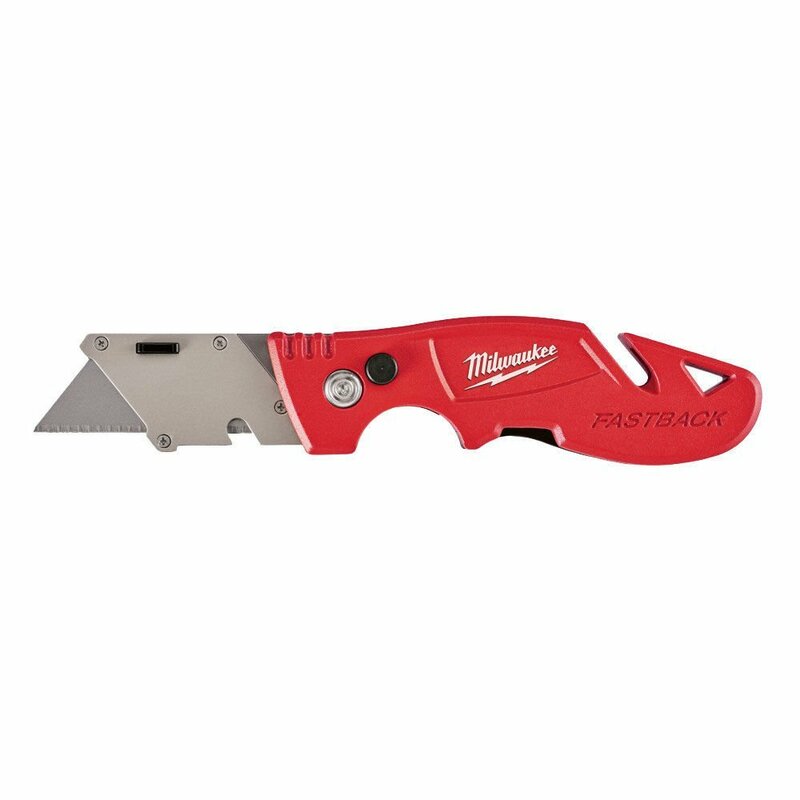 If you are looking for a premium knife, then Milwaukee Fastback II is the best and it is recommended by the professionals all over the internet. Lastly, if you need something which is very compact and has a retractable blade, then DeWalt DWHT10035L is for you. No matter which one you choose, they are all great knives.